The golden, yang warmth of autumn naturally transitions into to the cooler, yin season of winter. This seasonal shift alerts our horse companions to don their furry winter coats in perpetration for the cold. For me this is the signal to start my winter preparations around the barn. Along with filling the barn with hay, I begin my equine winterizing routine with the herb He Shu Wu. 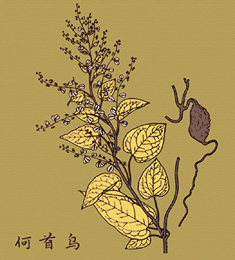 The Chinese herb He Shu Wu (polygonum multiflorum) is a warm, tonic herb ideally suited for the task. He Shu Wu can enable our horse friends to make a smooth seasonal transition into winter. Winter, from the Chinese perspective, is the season of the kidney and water. I encourage all my patients, both horse and human alike, to take this seasonal opportunity to warm, recharge and enhance kidney qi. Kidney qi is considered the “Root of Life”. It is the foundation for all the qi energies of the body, responsible for birth, growth, reproduction, bone development and longevity. Strong kidney qi can be compared to the charge in your car battery. When we keep the battery well charged it starts right up, keeps the headlights lit and runs all the other systems. He Shu Wu, a key ingredient in many Chinese tonic formulations, has been used as a longevity tonic for centuries. Its gentle warming nature is ideal to help the body stay well charged, resist infection, and resist the chills of winter. Additionally, modern clinical studies have shown it to reduce cholesterol, stimulate the development of red blood cells, and to act as an antibacterial. He Shu Wu is ideal for the older horse that has a difficult time maintaining condition or body weight during the colder months. I recommend feeding one half tablespoon of ground He Shu Wu daily throughout the winter, discontinuing it in the spring as the days begin to warm and lengthen. Avoid use in individuals that are prone to hypoglycemia or loose stools.